Protein is essential in the diets of dogs and cats, but more protein is not necessarily better. When it comes to eating high protein foods, some animals benefit, some animals do not benefit, and some animals are actually harmed by being fed higher protein diets. Each individual’s age, activity level, general health, and breed are all factors to consider when deciding whether high protein foods are right for them. As always, work with a veterinarian who understands nutrition* to find out the ideal diet for an individual animal. 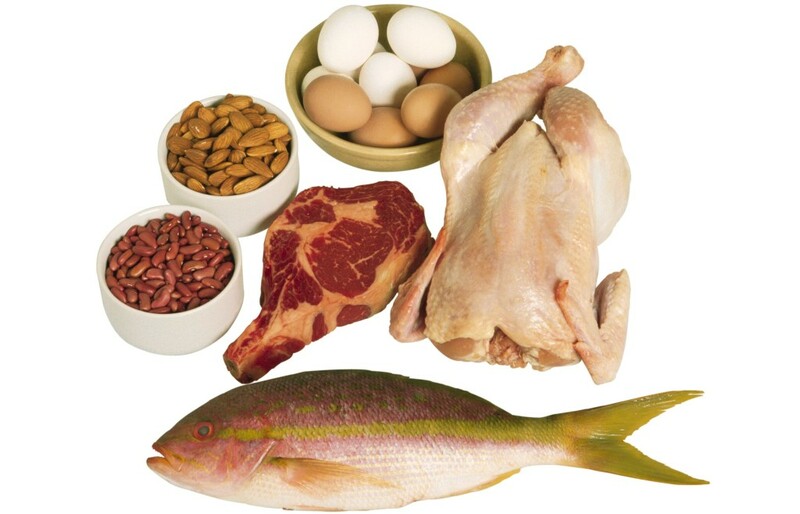 Proteins are the primary building blocks of brain, muscle, fur, and skin. Proteins affect metabolism; regulates pH; and are used in the production of antibodies, enzymes, hormones, and body tissues. Proteins can be turned into fat and stored, or can be burned as calories. If a pet’s body does not receive enough protein, or if the nutrients are not absorbed properly, their immune system becomes weak. What is the role of protein in a well-balanced diet for dogs and cats? Protein is one of many nutrients that are vital for cats and dogs. The ideal diet for each companion has the “proper” ratios of proteins, fats, carbohydrates, vitamins, and minerals. So what’s the “proper” ratio? Well, that varies for each individual. That’s why it’s so important to discuss your companion’s diet with a veterinarian who understands their nutritional needs. Different animals have different ideal protein levels depending on their age, metabolism, activity level, and lifestyle. In general, average healthy adult dogs need diets that are approximately 18% protein. Average healthy adult and senior cats need diets that are approximately 25-30% protein. Who benefits from high protein diets? Puppies and kittens – To grow at a healthy rate, 25-30% protein is best for most puppies, while 30-35% protein is best for most kittens. 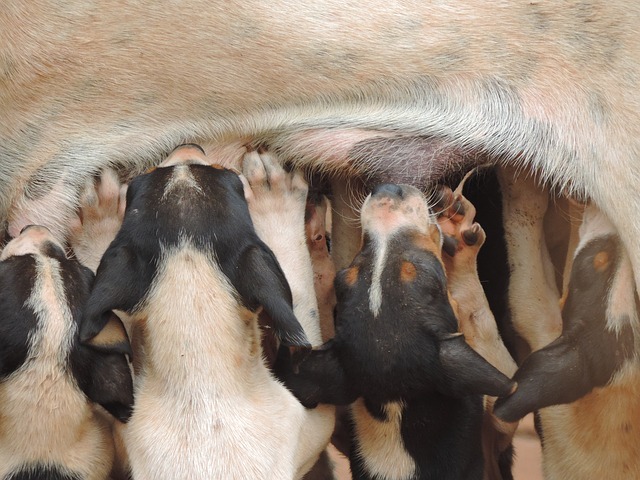 Pregnant and lactating pets – Lactating dogs and cats need a higher amount of a good protein to support their own health and also produce high quality milk for their litters. Diets that are 25-30% protein is best for most pregnant and lactating dogs, while 30% protein is best for pregnant and lactating cats. Sick or injured dogs and cats – Some veterinarians recommend higher protein diets to strengthen the immune system for pets recovering from illness: 25-35% protein for dogs, and 30% protein for cats. Performance and working dogs – High energy activities, like agility competitions and herding, can require higher amounts of protein because it promotes muscle strength and development, and provides calories that burn more slowly than carbohydrates – ideal for extended periods of activity. Performance and working dogs should have about 25% protein in their diet. Racing sled dogs have the highest protein requirements, around 35% protein. Who should avoid high protein diets? Large breed puppies – Large breed dogs who grow too fast can develop painful joint problems, so giving them high-protein foods can be detrimental to their health. Companions with impaired kidney function or underlying health conditions that strain the kidneys (such as diabetes). More protein means more work for the kidneys. Most veterinarians put these animals on lower protein diets in order to retain as much kidney health as possible. Elderly dogs and cats – As cats and dogs age, their bodies have increasing difficulty digesting proteins, so some veterinarians recommend that their diets have lower protein content. 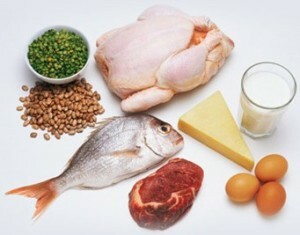 What problems can be caused by having excess protein in the diet? In theory, feeding a healthy adult dog or cat too much protein should not typically be a problem. In healthy dogs and cats, excess protein is either eliminated through urine or turned into fat. However, there is growing evidence that too much protein in the diet is linked to a number of health problems for dogs and cats, including developmental irregularities, hyperactivity, and destructive behavior. Some veterinarians also believe that pets who routinely have excess protein in their diets suffer kidney damage. It’s best to follow your veterinarian’s recommendation for the amount of protein in your pet’s food. Which protein sources are best? Many veterinary nutritionists say that it’s more important to evaluate the source and quality of protein, than to look solely at the percentage of protein in a particular food. Premium protein sources are those with the highest nutritional value, have nutrients that remain in-tact after processing, and with nutrients that are the easiest for dogs and cats to digest. Proteins from animal sources (muscle meat and organs) are much better for dogs and cats than proteins from vegetable sources because dog and cat bodies absorb amino acids in proper proportions when the amino acids come from animal protein. In fact, cats’ bodies have difficulty absorbing nutrients from non-meat sources. Cats’ bodies also require taurine, an amino acid found only in meat and eggs. For both dogs and cats, the best sources of highly digestible protein are eggs, muscle meat (particularly beef, chicken, lamb), and organ meat. The poorer sources of protein for dogs and cats are wheat, corn, meat by-products, soy, and rice. Holistic veterinarians and nutritionists recommend proteins from wild caught or free-range animals because these sources are usually free of antibiotics, growth hormones, and other harmful chemicals. Feeding novel proteins (proteins from sources that are new to an individual) is also a good idea. This is especially important for animals with allergies because replacing common proteins with novel proteins can often eliminate allergy symptoms. “High protein dog food” and “High protein cat food”. VetInfo.com. 16 June 2012. http://www.vetinfo.com/high-protein-dog-food.html and http://www.vetinfo.com/high-protein-cat-food.html. Messonnier, Shawn. Natural health bible for dogs & cats. New York: Three Rivers Press, 2001. Pitcairn, Richard. Dr. Pitcairn’s complete guide to natural health for dogs & cats. New York: Rodale Books, 2005.